Look for an instrument with an obvious upcoming movement in a clear direction on a higher timeframe. Entry after an Arrow => waiting for the pull back or wait for a second higher / lower candle, plus / minus a few pips. Entries => above and below channels after first pull-back (price comes back to the channel and touches it). Exit example => after a close beyond a High/Low of MA, here like 12 EMA H/L. 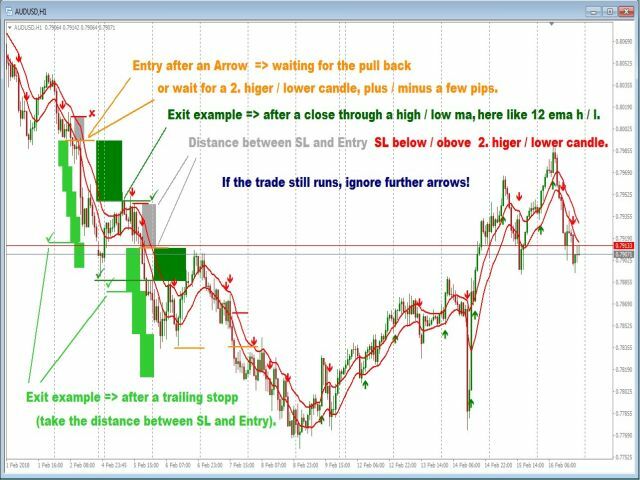 Exit example => after a trailing stop (take the distance between SL and Entry). Exit example => major Fibonacci and dynamic support/resistance Lines. Use the same to move your stop and for taking first profits. If the trade still runs, ignore further arrows. SL below/above the second higher/lower candle. Bars to process - the number of bars of the chart you want to be analyzed (60 to 1000 is recommended). show Vola today, Spread, Countdown - if true, it shows information about the volatility for today, the current spread and the countdown of the current period. Alert - activates the pop-up alerts. Alert - the chosen info will be in the header and the first line of an email, if Email is enabled. Email - if true, it shows the selected info in header and the first line of the email. 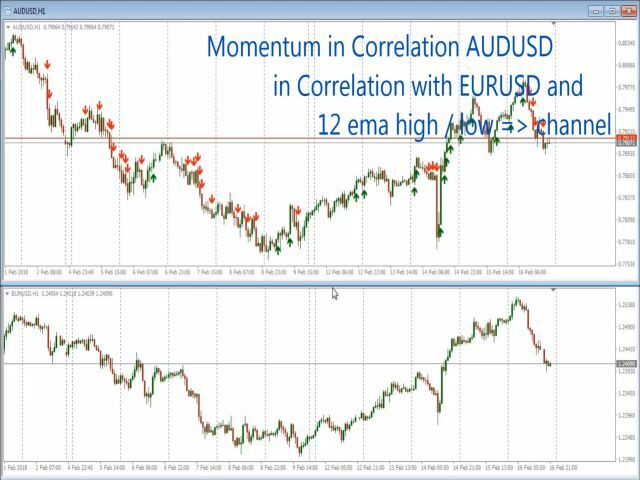 Notification - if true, it sends the alert to the MT4 APP of your smartphone. Screenshot - if true, it sends the alter with a screenshot to ...\MetaTrader 4\MQL4\Files. 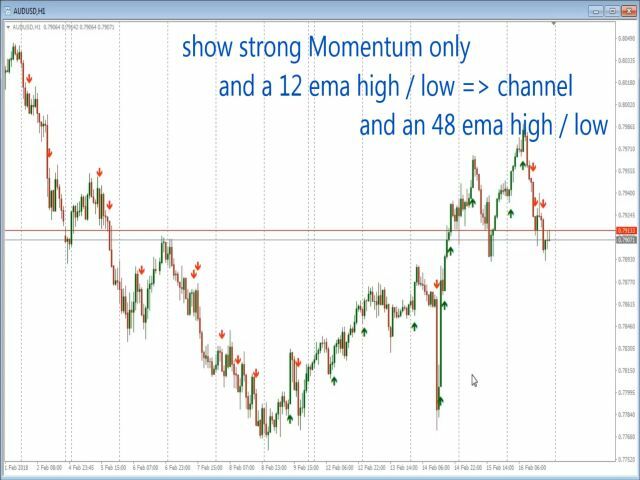 show first Alert-Arrow only "Live-Setting" - if true, there is no history arrow, only the first upcoming arrow of the trend direction will appear and stay, as long as the timeframe and instrument won't be changed. show Arrows - if true, it shows the chosen arrows only. 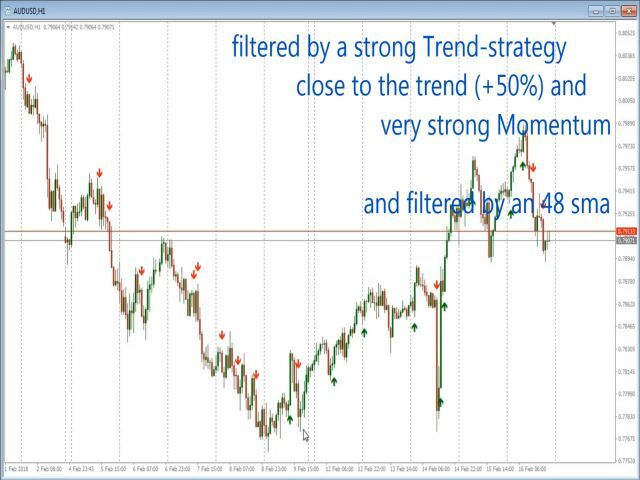 Trend-Strength - predefined EMA with different settings provide the filter for the momentum. very strong Momentum - if true, the momentum stands for solid candles and almost no wicks. 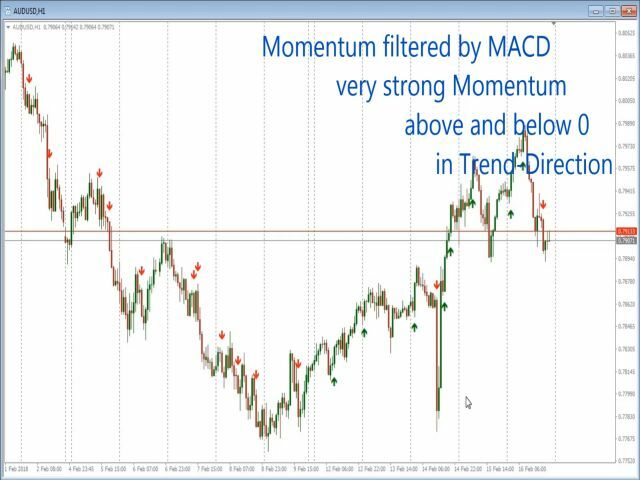 Momentum close to Trend only - if true, shows arrows close to the MAs that are predefined in the settings below. Trend plus % of ATR - the distance from the MAs to the candle will be calculated by the size of the current ATR in the current period. Parabolic Sar filter - a Momentum arrow occurs in the PSAR direction only (0.02 is recommended). Parabolic Sar Step - value for Step. Parabolic Sar maximum - value for Maximum. Arrow Style - choose a arrow style = thin, cross, normal, hollow, Thumbs, Triangle. Arrow Position - default is 0.6. Nice to have if you compare settings with a second/third indicator. I'm very pleased with your light. Welcome to China. Claus was very courteous, responsive, and professional after I informed him the alert function was not working properly. Great product and great seller, really helpful indicator. Will be buying this soon, by far best indicator i have purchased on here. I trade London Open and over a 3 to 4 hour window i have been getting 50 to 75 pips with this indicator on a live account. Best indicator i have used. I trade 5 min but mostly 15 min with it. 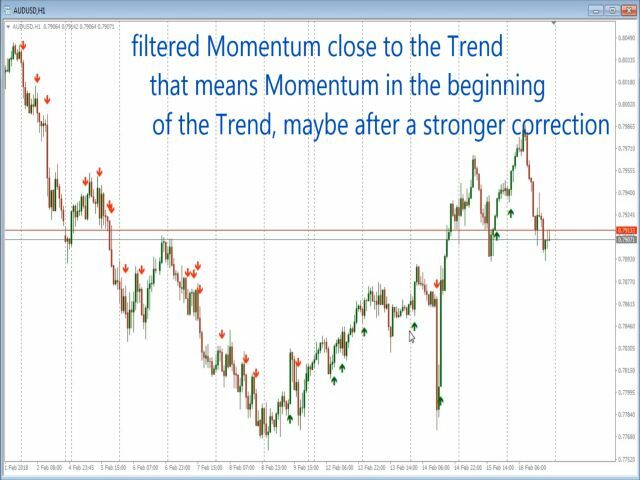 value for "Momentum close to the Trend only"
former function "Sidekick" renamed to "strong_momentum"